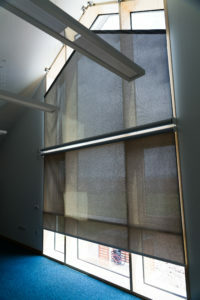 A church for the 21st century, the new Dumfries Baptist Church opened it’s doors on 12th May 2018. 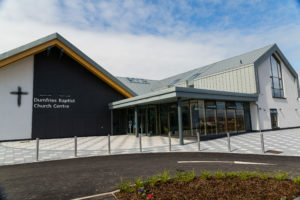 The 2,000 square meter community facility has a main hall with seating for 500, a cafe, sports hall, youth facilities, kitchen, toilets and changing facilities. 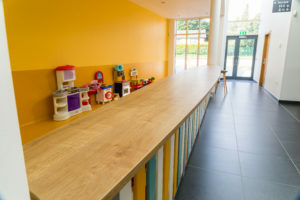 We were delighted to complete an FF&E package including bespoke motorised window blinds to fit uniquely shaped windows in the main hall, Corian® shelving, bookcases with adjustable shelving and a creche/toddler play area. 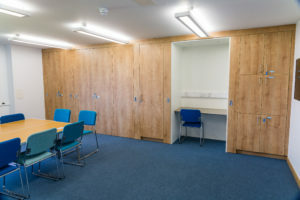 A cleverly designed “office in a cupboard” was built into fitted storage in meeting rooms where space was limited. 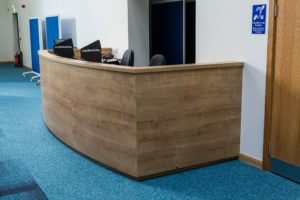 This is designed to optimise space and offers extra desks as and when they’re required.